Well what fun, summer get-togethers with both new and "annual" RV friends. This year Lovely Ouray "regular" John Q. brought his recently retired better half, Joalenn, along for his annual Colorado hiking pilgrimage. We had a blast getting to know her on trails and through chit chats over lunch and dinner. 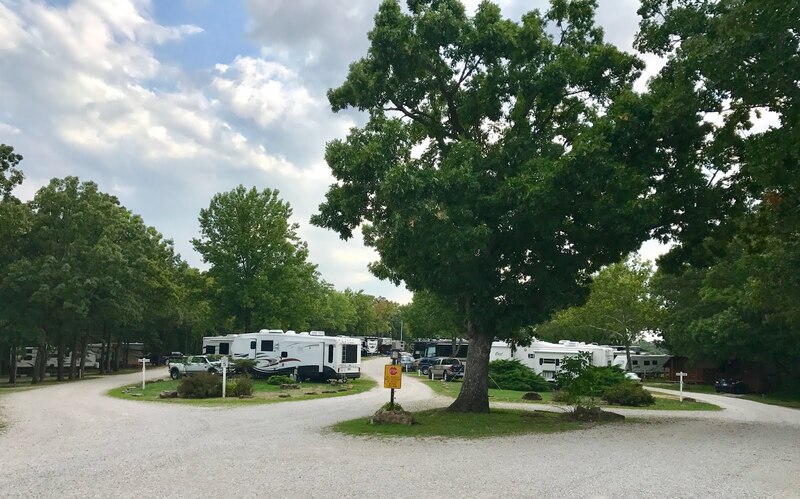 And now, salt-of-the-earth farmers from Illinois, Chris and Mindy, are camped at the 4J RV park…their vacation home base for Jeep tours that would scare the bejesus out of most flat-landers. We all joined up for pizza and beer last night at Mine Shack II, now our only house as we closed on the sale of Mine Shack I at 4:00 pm Monday. It's a step toward simplifying our lives, I think, maybe… hopefully… oh who knows. 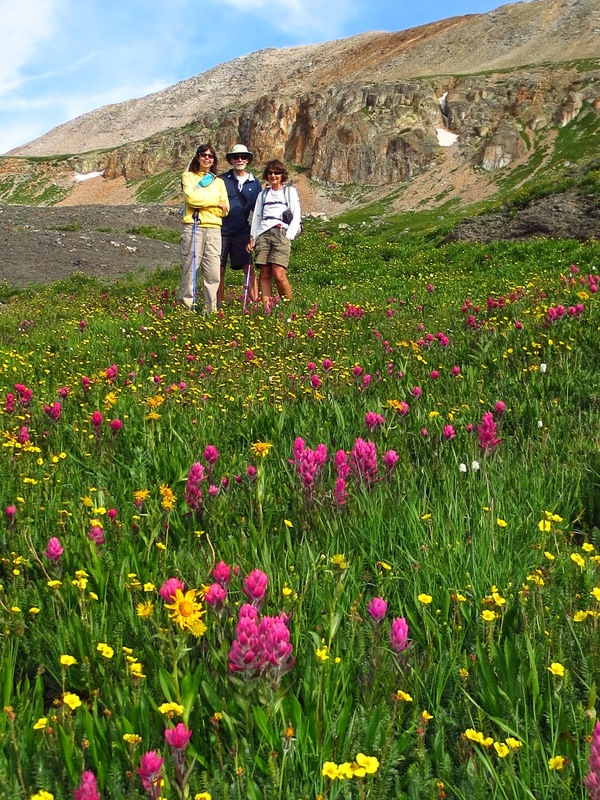 "Anchors Away:" A Wildflower Walk With John and Joalenn Q.
BCB regulars know of John Q's annual visits to Ouray; he's been featured every July since we landed here. Toward the end of his working life, just before he retired from the Corporate Jungle, John would spend lunch hours perusing a few RV travel blogs. When the day finally came to empty out his desk, he already had ideas about how he wanted to spend some of his free time. An A-liner pop-up camper was purchased, and Lovely Ouray was circled on his map. 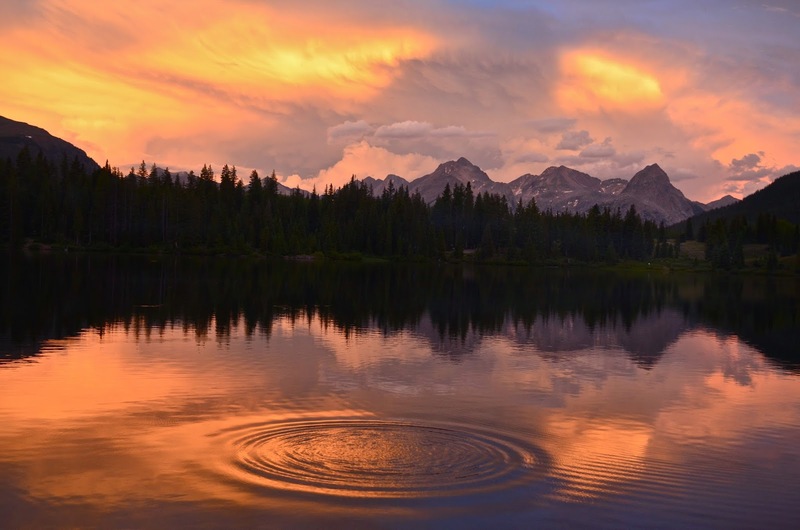 Dehui Yang captured the above photo of Molas Lake while camped above Silverton last week. We feel privileged that he shared some of his best "vacation" shots of our personal "stomping grounds." BCB readers are overdue for some quality photos shot through someone else's eye… someone (gulp) maybe even better than your's truly… so I thought it would be nice to share Dehui's photos with you. The majestic mountains pictured and reflected in Molas Lake are called the "Needles," located in the heart of the Grenadier Mountain Range. It's home to three fourteen thousand foot peaks, Eolus, Windom, and Sunlight, all of which we've summited. A stellar shot, Dehui. A few posts back you may have noticed Dehui Yang's comment box request to go hiking with Bobbie and I. A graduate student at School of Mines, he was coming over from Golden, Co. in order to explore the mountains around Lovely Ouray—this, largely based on my "beautiful" (his word, not mine) Postcard Photographs right here on the BCB. We had never met Dehui nor communicated before, but that didn't stop him from politely asking to tag along, and we are so thrilled he did. Besides, what better way to get to know someone than on the trail? Yesterday was my first real test at hiking above 11,000 feet; all systems were "Go," however, I would add "Slow" to that. Even Coffee Girl seemed to lack her usual rambunctious energy level. Bobbie was still feeling the effects of her recent eleven plus miles push to Bridge of Heaven, so I was in good company. Boonie learned the value of Gore-Tex lined shoes as we waded the soggy tundra and soft snow above Bullion King Mine and Lake. Cutthroat Trout by the dozens plied the shallow waters near the bank for food, reflecting fluorescent red and green in the early morning sun. Wildflowers are a little late this year due to lingering winter snows, but it was still a beautiful place to hang out and watch atomic bomb monsoonal clouds mushroom into the stratosphere. That's my six foot three inch—body by CrossFit—son, Caleb, approaching "Bridge of Heaven" on a hike with Bobbie. The snow is about gone above timberline, which means the long-awaited wildflower season is upon us. Sidewalks are jammed, parking nonexistent, one hour waiting lines at restaurants, yet they come—year in and year out. Fourth of July Tourists looking to see a good fight, retribution for lost bragging rights…maybe even a little blood. It's Lovely Ouray's equivalent to Bull Fighting in Spain, a duel that leaves opponents alive, but exhausted and bruised for days. It's amazing what 90 pounds of pressure will do to water. A fire hose nozzle can be a weapon of destruction—knock you off your feet, steal your breath, freeze you stiff, and leave you black and blue. The contestants call it fun, the crowd calls it crazy. You just have to see it to believe it. Ala Garrison Keillor, It's been a busy week in Lovely Ouray. As the detritus of Lake "Woe-is-me" fades like a bad dream, Life, as I once knew it, is beginning to reemerge from the wretched fog of "complications" like a long lost ship. Thank God for Lighthouses.